Product prices and availability are accurate as of 2019-04-24 00:39:41 UTC and are subject to change. Any price and availability information displayed on http://www.amazon.com/ at the time of purchase will apply to the purchase of this product. Life Fitness 95X Engage 15" Display LCD Monitor Elliptical Cross Trainer - Seller Refurbished w/ Warranty. Extensive biomechanical research for the Life Fitness 95x Engage Elliptical shows that this machine creates a natural fluid motion that closely replicates running or walking. It's a comfortable and effective total-body workout that helps users achieve their fitness goals. Quiet Drive Technology ensures a relaxing workout environment. The unique Hybrid feature reduces energy consumption from the console when a high enough intensity level is achieved. A green hybrid icon alerts users they are helping power the equipment. Energy generated and saved is displayed with results at the end of each workout. From high-performance athletes to those looking for a low-impact workout, this cross-trainer really motivates. 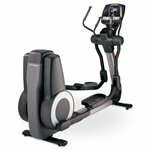 Extensive biomechanical research for the Life Fitness 95x Engage Elliptical shows that this machine creates a natural fluid motion that closely replicates running or walking. It's a comfortable and effective total-body workout that helps users achieve their fitness goals. Quiet Drive Technology ensures a relaxing workout environment. The unique Hybrid feature reduces energy consumption from the console when a high enough intensity level is achieved. A green hybrid icon alerts users they are helping power the equipment. Energy generated and saved is displayed with results at the end of each workout. Features Exercise Programs: Quick Start, Manual, Random, Hill, Cardio, Fat Burn, Heart Rate Hill, Heart Rate Interval, Extreme Heart Rate, Around the World, Cascades, Foothills, Kilimanjaro, Navy PRT, Fit Test, Custom Workouts (8), Create Your Own Workouts (2), Cross-trainer Aerobics, Cross-trainer Reverse, Speed Training, Speed Interval Training, Time Goal, Calorie Goal, Distance Goal, Distance Climbed Goal, Time in Zone Goal, Pace Goal, Customized Cool Down. Power Requirements: Self-Powered with Plug-In Option Max User Weight: 400 lbs. Product Weight: 442 lbs. Length: 88 in. Width: 31 in. Height: 65 in. Display Readouts: Speed, Resistance Level, Heart Rate, Pace, Elapsed Time, Time Remaining, Time in Zone, Time of Day, Distance, Distance Climbed, Distance Remaining, Calories, Calories Per Hour, Watts, METS, Custom Messaging, Workout Profile.